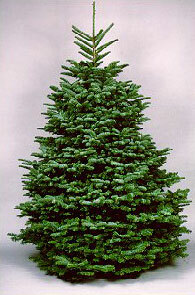 Noble Fir: The needles are roughly 4-sided (similar to spruce), over 1 inch long, bluish-green but appearing silver because of 2 white rows of stomata on the underside and 1-2 rows on the upper surface. The needles are generally twisted upward so that the lower surface of branches are exposed. In the wild, the trees are tall, beautifully symmetrical and grow to over 200 feet in height. Long considered an excellent Christmas tree because of its beauty, stiff branches and longevity, the species is growing in popularity (between 25% and 30% of the fresh tree market in the Pacific Northwest). It is also widely used in the greenery business to make wreaths, door swags, garland and other Christmas products. Trivia: The R.A.F. Mosquito planes of World War II were built with Noble Fir frames.